An indoor pedal car, kids balance their way across the floor, one rotation at a time. Interior bearings make for a smooth ride. Powder-coated steel supports with soft rubberized foam handles. 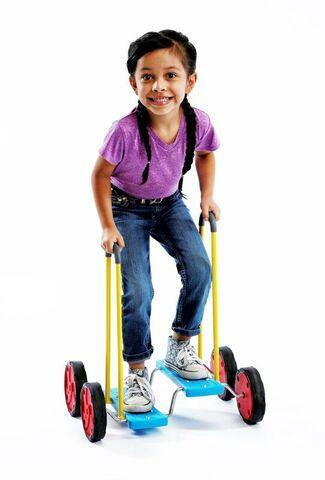 Wheel Walker takes balance and coordination to another level. At the beginner stage, children use the provided handles while balancing and “walking” their way across the floor. Once ready for the advanced stage, they can remove the handles for another challenge of balance and coordination. Weight limit: 100 lb. Dimensions: L: 20" x W: 14" x H: 7"